What used to be Ljubljana's pride and the home of healthy sporting spirit slowly transformed into an urban ruin, pointing to a much more complex problem of spatial apathy and disorder. 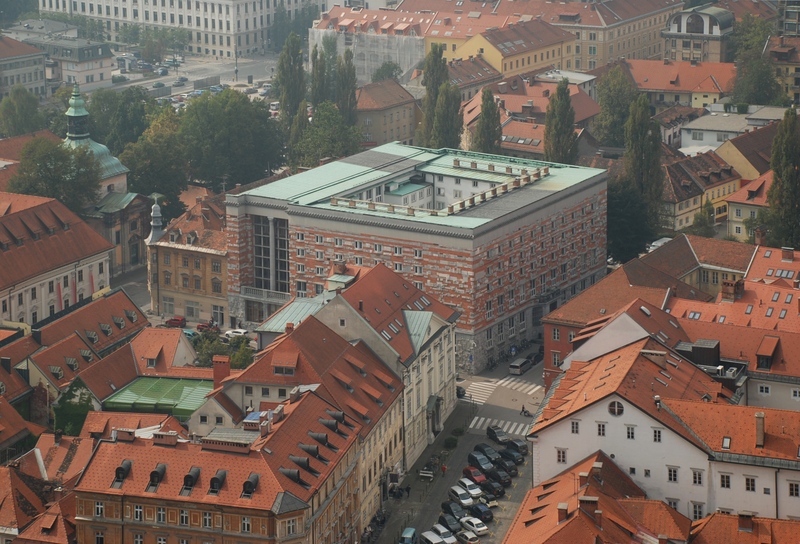 Few cities bear the influence of a single architect as much as Ljubljana. Jože Plečnik dedicated most of his time as a practising architect to the improvements of his home town. He redefined the image of the city according to his vision of a new, modern capital, transforming Ljubljana in a set of projects, ranging from small-scale interventions such as statues, pavements and benches, to squares, buildings, bridges, regional plans, the city’s market, cemetery and the central stadium. Most of Plečnik’s legacy is considered of national importance and is protected by the Institute for the Protection of Cultural Heritage of Slovenia. His works are respected, deeply integrated into Slovenian culture and, even more importantly, the spaces Plečnik envisioned are still widely used. They are functional and in most parts the original idea and narrative behind the design remain easily identifiable. Plečnik managed to create works that have withstood the ravages of time, works that gave Ljubljana its Mediterranean feel, monumentality and beauty. National and University Library of Slovenia (1936-1941) designed by Plečnik. When visiting Plečnik’s most known works, flipping through the tourist guides of Ljubljana or just walking around the city centre, one can easily forget that one of his works has slowly transformed into an urban ruin, the so-called ‘shame of Ljubljana’ and the most neglected and abandoned Plečnik monument. 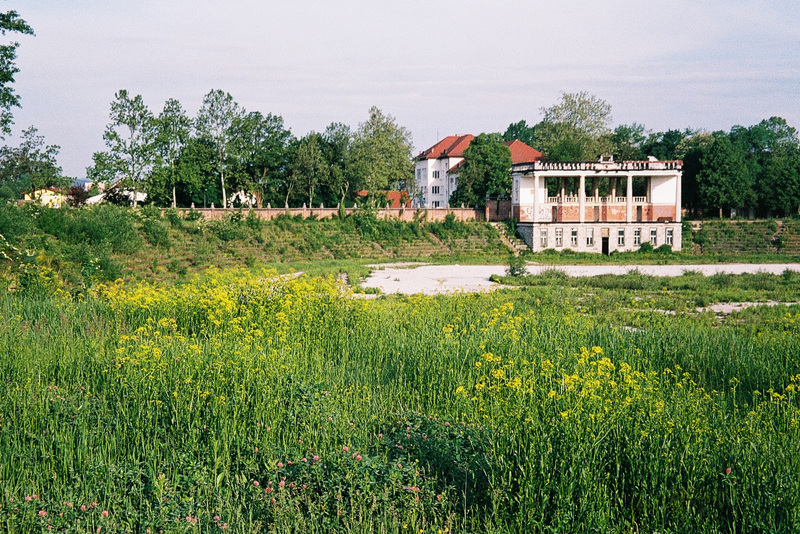 Covered by overgrown vegetation, locked away from public view, and every day a step closer to complete destruction, Plečnik’s stadium does not only represent a harmful impoverishment of the country’s cultural heritage. Rather, it also tells a much more familiar cautionary tale for our time – a tale of land use conflicts, inadequate spatial policy and a refusal to engage in constructive dialogue. It is, furthermore, a story that belies the public’s understanding of the irreversibility of radical spatial transformation. In 1923 the Catholic youth sport association Orel (‘Eagle’) decided it was time to build a permanent stadium that could host their open air mass gymnastics festivals. The site of an abandoned gravel pit was chosen as the new location for the stadium and Plečnik was asked to transform the site into a meaningful place, promoting gymnastics and healthy lifestyle. The stadium was one of the architect’s early commissions. However, due to unreliable financing, progress was slow. On account of this, the original architectural elements show two clearly identifiable periods of the architect’s interwar style – expressionism and Plečnik’s classicism. The last structure built before the war was the Glorieta, a temple-like pavilion, built in 1935, to serve as an altar during the Eucharistic Congress. Back then probably no one imagined that nine years on the entire stadium will be draped in Nazi flags when in 1944 the members of the Home Guard and Slovenian anti-Communist militia swore loyalty to Nazi Germany on the occasion of Hitler’s birthday. 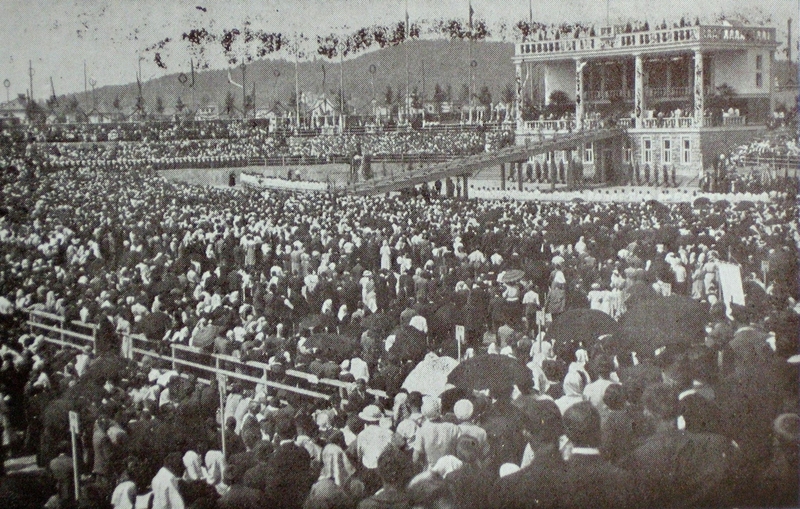 The Eucharistic Congress in 1935.
he dismantling, altering and degrading of the original structure were met with little serious concern on the part of the authorities. Commercialization prevailed and the stadium lost its principal cultural features. Similar actions continued well into the late 20th century, presenting either structural, aesthetic or cultural devastation of the stadium. There were some initiatives to renovate it, but at most such attempts addressed the current needs without considering the stadium’s future role, protection and management. 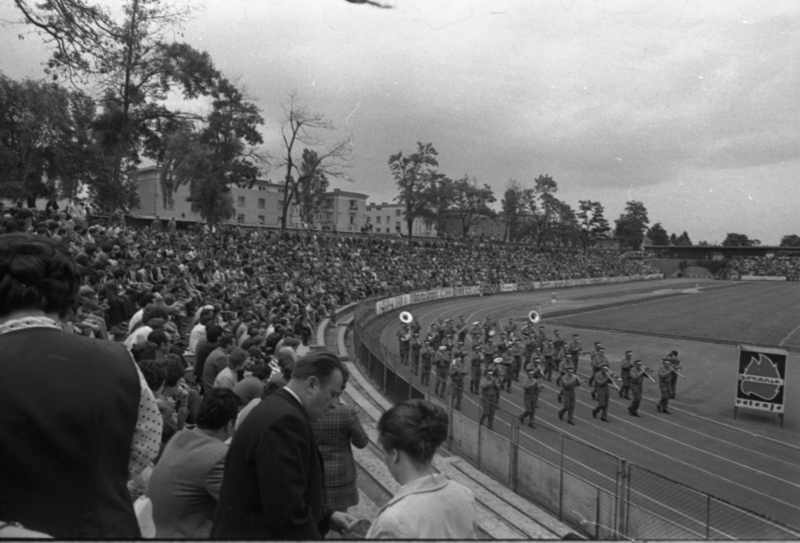 The stadium in the 1950s. In 1993 the stadium was in an alarming state of disrepair. But the football matches and concerts continued. As the stadium was not built to host mass football events it eventually failed to meet the FIFA standards for international games. It hosted its last game in August 2004, after which it was left empty, awaiting a much needed restoration. 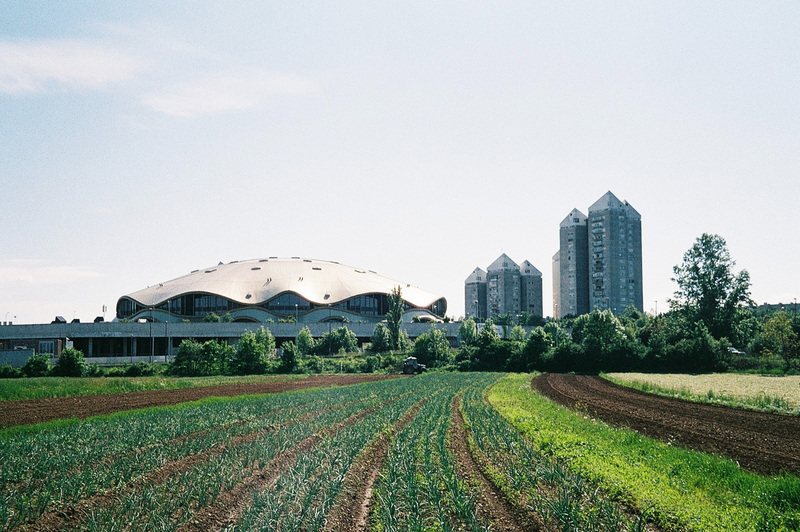 In 2007 the Bežigrad Sports Park (BSP) private – public partnership was established between the City Municipality of Ljubljana, the Olympic Committee of Slovenia and the GSA Company, with the main aim to renovate and manage the stadium. The majority owner of the BSP, Joc Pečečnik, a local businessman, promised to bring the stadium back to its former glory and to modernize it, whilst also ensuring it would retain the original elements of Plečnik’s architecture. In 2008 the stadium was closed off to visitors and by the end of the year an international ideas competition was announced to revitalize the stadium and to find the most appropriate solution integrating Plečnik’s legacy with the investor’s desired program. The plan by a recognized German architectural office was chosen, with construction costs estimated at roughly two hundred million euros and building to begin in 2009. The winning project was said to ‘integrate the historic elements of the existing components and create a formal and functional unity without impairing the original design principles’ (GMP architekten). The whole idea of the stadium being renovated according to the cultural heritage protection guidelines was quickly picked up on by the general public. Following their lead, the media tried to push the authorities to issue the building permit as soon as possible. From afar everything seemed promising. But the initial promise was put into question when the stadium’s nearby residents and some eager defenders of Plečnik’s legacy started to draw attention to some previously overlooked aspects of the project. These detractors have claimed that the renovation fails to respect the stadium’s rich and diverse history and that the chosen solution does not properly maintain and protect Plečnik’s original architecture. Moreover, they have argued that the whole project is actually more about the proposed adjacent commercial buildings than the stadium itself. The critics hold that, by being squeezed in-between the high rise buildings, the stadium will lose its identity. If we look closer at the project’s program: the newly designed complex combines business, commercial and sports facilities. Along with the local football team as a user, a number of other commercial functions are accommodated on the site, intended to make the area commercially viable. 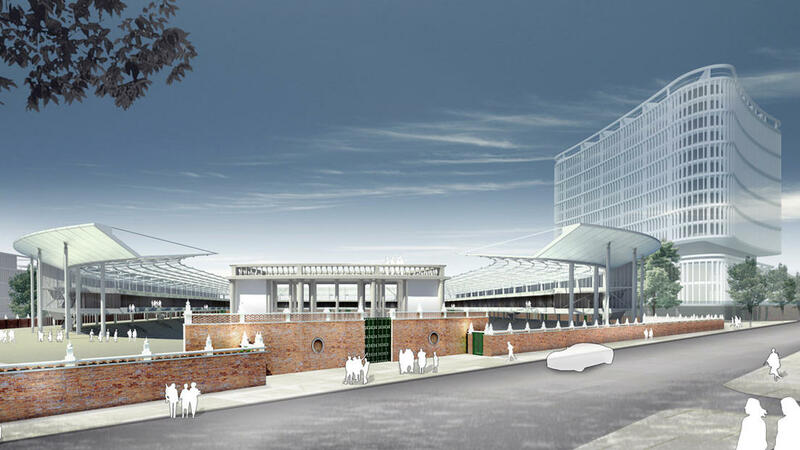 There are six subterranean floors planned underneath the stadium and the newly built adjacent buildings. These accommodate a car park as well as other functions such as shopping, an indoor climbing hall, sports hall and events areas. In the new high rise building a hotel with apartment areas is proposed along with a sports medicine clinic, shops, restaurants and office spaces. However, giving space to the three new office buildings planned on the North side of the stadium has meant that the current allotment gardens would have to move. Allotment gardens behind the northern side of the wall. The latter particularly upset the nearby residents and the gardens owners, who submitted a proposal to the court to determine the land appurtenant to their apartment blocks in 2009. The court has not yet decided on the proposal. In the same year the stadium was declared a monument of national importance by the Institute for the Protection of Cultural Heritage of Slovenia. That brought even more precise cultural heritage renovation guidelines and the strict restrictions for the buffer zone around the monument, where inappropriate actions could have considerable impact on the value of the site. In 2011, the BSP partnership applied for environmental protection consent, needed to obtain a building permit. A year later the consent was issued but after numerous complaints filed against the environmental impact assessment (primarily because of the noise level during construction and later operation) the project was, after reconsideration, found not following environmental protection requirements and the consent was withdrawn. Now the Ministry of Agriculture and the Environment is reassessing the proposed construction. Even if the consent eventually gets issued, with no possible complaints, that would only bring the investor a step closer to obtaining the building permit but would not eliminate all of the other remaining barriers on the way to the desired construction. The nearby residents are determined to do whatever it takes and to use all of the available legal remedies to prevent the actual building on the site, even though they are being constantly accused of preventing progress, obstructing the reconstruction and being proclaimed as the culprit for the stadium’s accelerated deterioration. The local demand for a new multi-functional sports and commercial facility can be questioned. In 2010 Ljubljana already got a brand new football stadium and multipurpose sports hall – Stožice, including a big shopping centre, underground parking garage and a recreational park. Even though until today only the stadium and the indoor arena are completed, the 182,000sqm Sports Park Stožice has since hosted all of the major football matches, concerts and various sports events. Sports Park Stožice (multipurpose indoor arena). But what if the stadium is left a ruin? 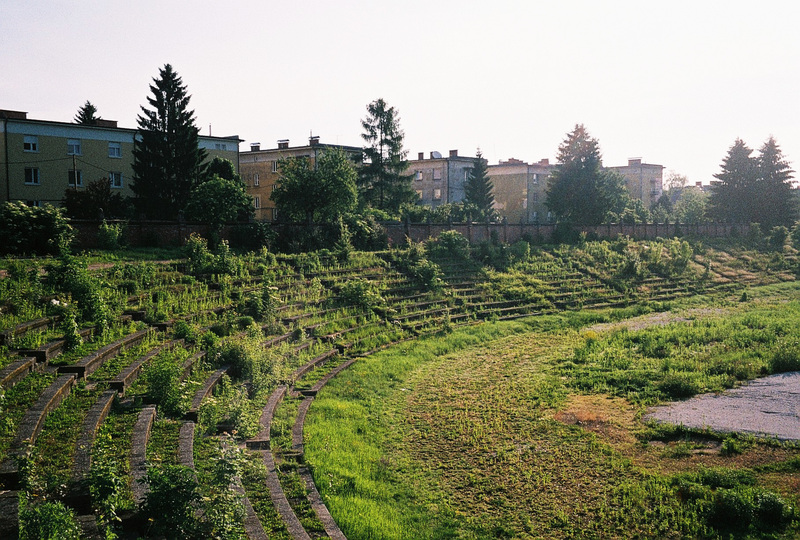 If they are prepared to overcome the many obstacles to access, the visitors to Plečnik’s stadium will find themselves in a place of architectural decay and melancholy. But in spite of this, it retains an aesthetic presence, an overlooked beauty hiding behind the high walls. The desolate stadium is actually full of life. The smell of elderberry flowers is everywhere, different clovers are blooming and climbing plants wrap themselves around the pillars. In a profit-oriented world where land, space, and even nature (whatever these denominations represent) are increasingly seen as commodities, such places are hard to find. Places of impressive scale and in an urban setting, in which nature takes over and is allowed to be, even if its future existence remains uncertain. An enclosed piece of land where the ‘wild’ is of no use to humans, under no direct or even allowed human intervention and where simultaneously the very absence of human agency allows the ‘wilderness’ to flourish. When debating the current state of the stadium there seem to be many opposing views on what has actually failed – some see failure in Plečnik’s architecture, not being able to adapt to the needs of the modern man. Others see it in the actions of the Institute for the Protection of Cultural Heritage, especially for their lack of action throughout the years. 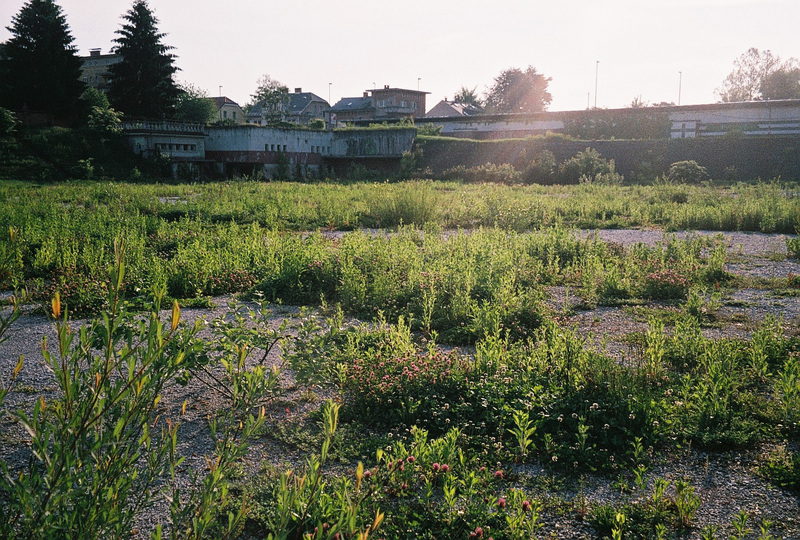 Some highlight the failure of the City Municipality of Ljubljana, the BSP partnership and the nearby residents. And still more envisage a future failure in the stadium’s reconstruction. Whatever the opinion, it is obvious there is no single reason behind the stadium’s degradation. 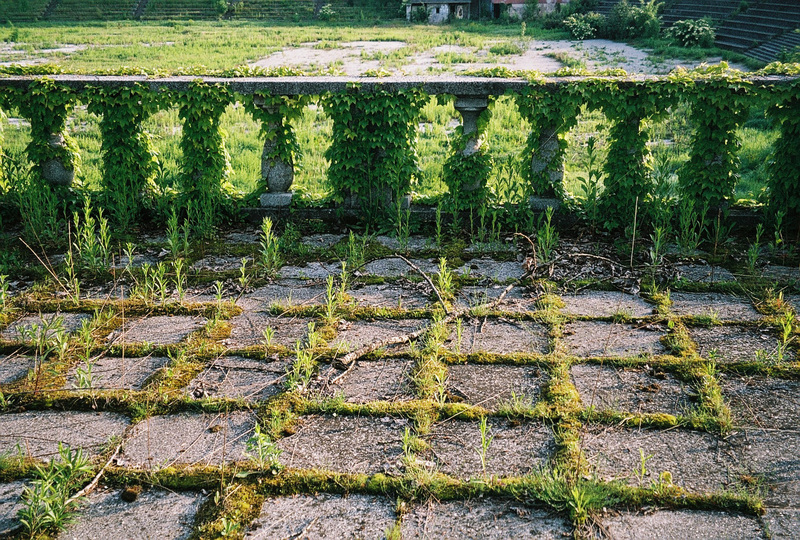 The cracks in the pavement, the overgrown tribune and the damaged wall are not the cause of the stadium’s decay. Rather, they are the symptoms pointing to a much larger problem, a problem of spatial apathy and disorder, of insufficient public participation, of poor cultural heritage management and of a formulation of a country’s spatial and architectural policy which leaves much to be desired. What seems crucial at this point is to redefine the stadium’s role in the future, to critically and professionally evaluate what has been lost and what can still be held on to. To find, not a compromise, but the one best solution for the area. And most importantly, to act! Until then, the stadium will continue to be seen as a failure. It will stay closed off and forgotten, left to the wide variety of plants to thrive. 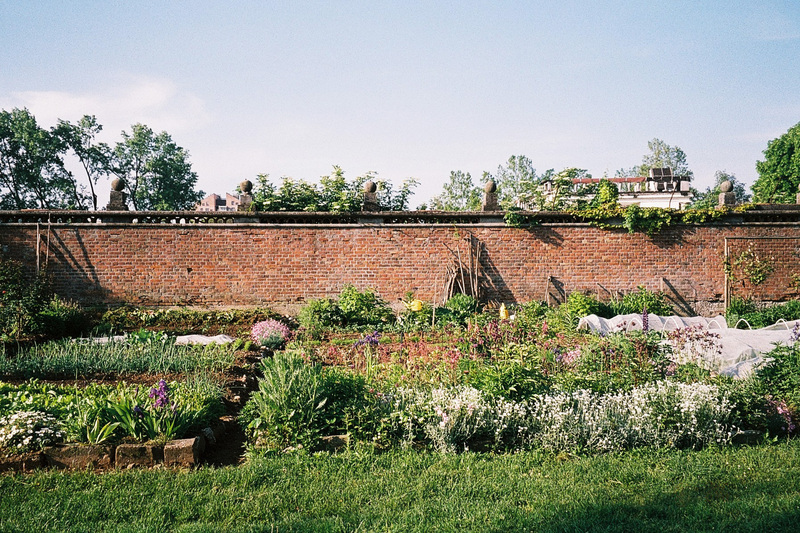 Barbara Prezelj is Slovenian and holds a BSc degree in Landscape Architecture from the University of Ljubljana. She is currently completing an MSc in Architecture, Urbanism and Building Sciences (Landscape Architecture Track) at Delft University of Technology.